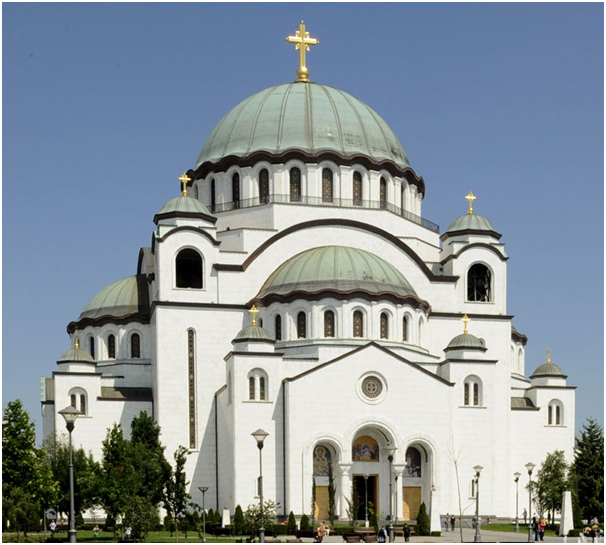 Hram Svetog Save (St. Sava’s Temple) is one of the most visited attractions in Belgrade. Our country is traditionally Christian, and main religion in Serbia is Eastern Orthodox. Mostly, Serbian population is Orthodox Christian (over 80% of population), on second place are Roman Catholics, then Muslims, Protestants, Jews, etc. Serbia is traditionally Christian country ever since 9th century when Byzantine Christian missionaries, Cyril and Methodius, did Christianization of Serbian people. While the most of the world is celebrating Christmas on 25th of December, in Serbia, considering it’s Orthodox Christian country, Christmas takes place on 7th of January (Orthodox New Year’s Eve takes place on 13th of January). We take Christmas pretty seriously, and on a Christmas Eve, we spend our night at home, having diner with friends and family. Traditionally at midnight, all together go to the church to welcome Christmas at midnight. And than, an Orthodox priest places the badnjak on the fire during Christmas Eve celebration exactly at midnight. The badnjak is an oak log or branch brought into the house and placed on the fire on the evening of Christmas Eve, much like a yule log in other European traditions. Saint Sava’s Temple is the most visited temple during this night. 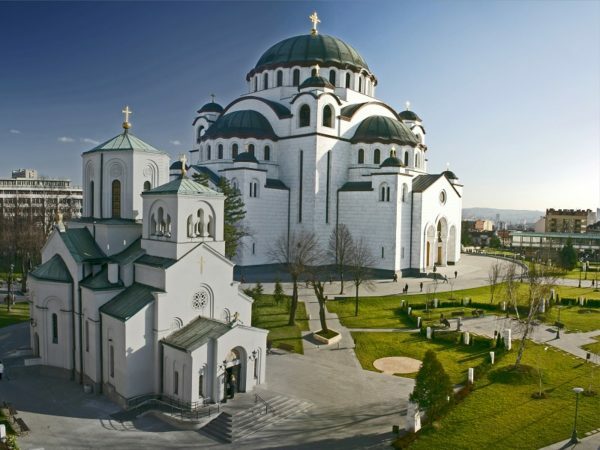 It is located at Vracar plateau (municipality of Belgrade), and it is considered as one of the biggest Orthodox churches in the world. It is dedicated to Saint Sava, first Serbian saint. Known as The Enlightener, was a Serbian prince and Orthodox monk, the first Archbishop of the autocephalous Serbian Church, the founder of Serbian law, and a diplomat. He did’t wanted to be a ruler, he left Serbia to become a monk, with the name Sava (Sabbas). At Athos, he established the monastery of Hilandar, which became one of the most important cultural and religious centers of the Serbian people. The Church of Saint Sava in Belgrade is dedicated to him, built where the Ottomans burnt his remains in 1594 during an uprising in which the Serbs used icons of Sava as their war flags. He is widely considered as one of the most important figures of Serbian history. Saint Sava is canonized and venerated by the Serbian Orthodox Church, as its founder, on January 27. In 1895., three hundred years after the burning of Saint Sava’s remains, the Society for the Construction of the Church of Saint Sava on Vracar was founded in Belgrade. Its goal was to build a temple on the place of the burning. A small church was built at the future place of the temple, and it was later moved so the construction of the temple could begin. Only foundation had been completed, then WW II began. Construction of the building began again on 12th August 1985. The greatest achievement of the construction process was lifting of the 4.000 ton central dome, which was built on the ground, together with the copper plate and the cross, and later lifted onto the walls. The lifting, which took forty days with the especially constructed hydraulic machines, was finished on 26th June 1989. In 2017., the exterior of the church is completed. . The Russian Academy of Arts under the guidance of Nikolay Mukhin is currently working on the internal decoration. The church is centrally planned, having the form of a Greek Cross. It has a large central dome supported on four pendentives and buttressed on each side by a lower semi-dome over an apse. The main dome has highs of 70 meters, while the main gold plated cross is 12 meters higher, which gives a total of 82 meters to the height Church of Saint Sava’s Temple. The peak of the church is 134 meters above the sea level. Therefore, the church holds a dominant position in Belgrade and it’s highly visible.